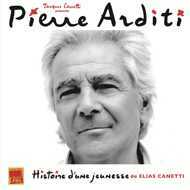 This record won the famous 2015 french prize " Grand Prix Charles Cros" Pierre Arditi, famous french actor , reads " histoire d'une jeunesse (story of my youth) " by Elias Cantti (who was Nobel Prize of litterature), with musical background by Eric Slabiak. The Arditi & Canetti families are very close because the mother of Elias Canetti was Mathilde Canetti. For Pïerre Arditi it also deals with the story of his family .